A mother’s love transcends geographical boundaries and political strife. This is true for Christine (Amy Staats), a New York actor who plunges into the incredibly bureaucratic and complex process of international adoption. Her love for her future daughter from the Republic of Georgia is unconditional. Christine’s relationship with her own mother (Mary Francina Golden), however, is not so steadfast. “The Sun Shines East” explores these maternal relationships side-by-side, revealing that a mother’s journey to loving her child has far more complications than we might expect. Corinne Chateau’s play is based on her own experience adopting her son from the Republic of Georgia seventeen years ago. It is no surprise then that much of Christine’s frustration and anxiety regarding the adoption process rings true. After a miscarriage renders any chance of carrying a child to full-term life-threatening, Christine and her husband Robert (Bristol Pomeroy) travel to Georgia to adopt an infant whom they name Claire. However, their return to the United States is impeded when the first lady of Georgia issues a moratorium on international adoptions. Christine and Robert struggle through the process over a period lasting several months involving political favors and relentless phone-calling and traveling to Georgia at least two more times in the hope of finding someone compassionate to their plight. Meanwhile their marriage struggles through their anxieties and depression. The process’s effect on Christine and Robert’s daily life together is the most tangible and realistic representation of the couple’s anxiety. Meanwhile, we also explore Christine’s estranged relationship with her mother, who manages somehow to be both harsh and detached at the same time. The latter half of the show, in which the stakes are raised enormously for Christine and Robert, feels much more heartfelt than the first half. Part of the reason why there is a discrepancy between these two halves is a change in structure. The first half makes abundant use of having the characters perform inner monologues. These monologues reveal very little more than what a we could have already detected from the play’s dialogue, and they just make the characters’ emotions seem heavy-handed and disingenuous. In one monologue, which takes place right before Christine meets her baby for the first time, Christine goes into a bathroom stall and panics. Then, she recites the “Hail Mary” prayer. This monologue just seems redundant and out-of-place, since we the audience can already tell she is nervous and since no mention of religious faith ever occurs in the rest of the play. Similarly, Christine’s mother keeps appearing in the foreground, subconsciously reminding Christine that she would not make a good mother. Christine’s anxieties regarding her mother are already obvious in the dialogue, and these interruptions just dismantle the subtleties in the rest of the text. Once Christine has met her baby and faces the ensuing trials, these monologues disappear, and the emotion, in turn, intensifies. In fact, my guest and I found ourselves unexpectedly teary-eyed by the end. Each mother in the play, including the Georgian Minister of Justice whom Christine pleads with for assistance at her journey’s end, has her own difficult experience of motherhood, and when these experiences are presented inmitigated, Chateau’s script truly shines forth. 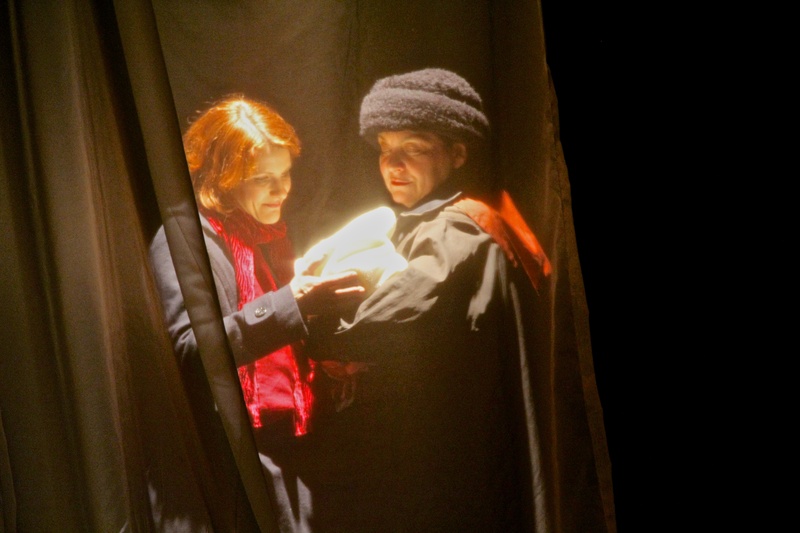 The play also carefully stops itself from becoming a white-woman-helps-poor-minorties story by providing examples of strong Georgian women like the Minister of Justice and a pediatrician named Dodo who helps Christine to counteract the poverty and corruption of the Georgian country. The Sun Shines East is truly a heartfelt and nuanced representation of motherhood, and Corinne Chateau’s experience-based script is eye-opening. 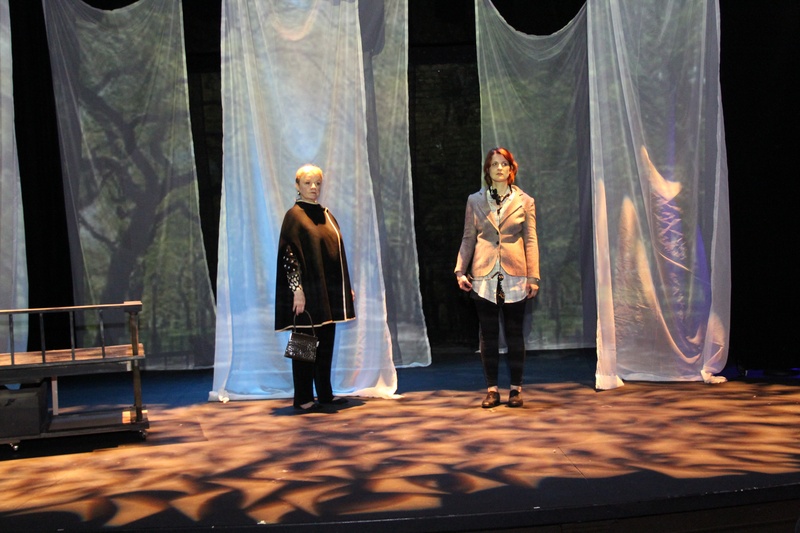 The Sun Shines East is playing at the Marjorie S. Deane Little Theater through February 16th.